For fans of Jo Nesbo and The Bridge, The Ice Beneath Her is a gripping and deeply disturbing story about love, betrayal and obsession that is impossible to put down. Fast-paced and peopled with compelling characters, it surprises at every turn as it hurtles towards an unforgettable ending with a twist you really won’t see coming . . .
Police Officer, Hanne a retired police profiler with early onset of Dementia and Emma the secret girlfriend/fiance of a missing CEO Jesper Orre, where the body of a beheaded unidentified body of a woman has been found at his home. There is also three time zones. The first is present day, the second is ten years in the past where Peter and Hanne worked on a very similar case and finally only 2 months ago as Emma tells her story, her life with Jesper. This sounds complicated but it is far from it. I so like a compelling and busy read that constantly gains momentum as the story unfolds. There is a superb cast of characters that are quite compact really making it so very easy to follow the story line. The three main characters you obviously get to know more in depth. Their thoughts feeling and fears. Each of them dealing with life very differently but each still with their own hidden demons. What I like about this type of book is that you get know how each person honestly sees and assesses a situation. This is quite a macabre story and it does involve scenes that are gruesome so if you are easily disturbed it probably isn’t for you. I wish to thank Netgalley and the publisher for the opportunity to read this book in exchange for an honest review. Camilla Grebe was born in 1968 in Stockholm, Sweden. She holds a degree from the Stockholm School of Economics and was a cofounder of audiobook publisher Storyside. Together with her sister Åsa Träff she has written five celebrated crime novels about psychologist Siri Bergman. The first two books in the series were nominated for Best Swedish Crime Novel of the Year by the Swedish Crime Writers’ Academy. Grebe has also written the popular Moscow Noir trilogy with Paul Leander-Engström. 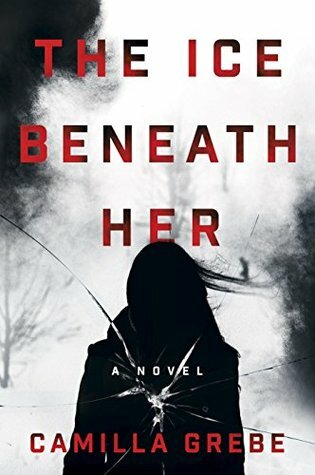 With The Ice Beneath Her, Grebe breaks out as a solo author with a unique voice and a masterful handle on suspense. What a great review. I found it far more compelling than I expected to with great interplay between the characters. This is the second review I’ve read on this book and both say such positive things I will be picking up a copy.